I let go of all the thoughts which could worry me, and carry on down, slowly and carefully, but soon find myself loosing all ability to focus. My body feels like it is made of lead, and my mind, too, is heavy like a sleeping elephant. It is when we reach the Third Step that I realize just how sick and exhausted I really am. My legs are so limp that they won’t support me and my arms – so weak, they can’t hold me on the rope. I make myself look at the corpse in the snow under the vertical Step for ‘motivational’ purposes before I begin the descent. Once at the bottom, I can only bring myself to make a couple of small steps, and sit down to rest and cough. It’s not a safe place to stop, as the body behind my back reminds me. I must get up and continue downwards; this thought and the movement it eventually triggers – everything is in slow motion. When we reach the top of the Second Step, I finally see Margaret. The chest infection we both caught in the tent village near base camp has taken greater toll on her than it has on me (Margaret summited Everest from the South Side in 2011; she is 62 years old, I am 25). My friend is struggling, running out of energy, oxygen and time to make it to the summit. We sit down behind her, Cheddar and Nima Nuru to rest – again – when Margaret, very quietly and gracefully, decides to turn around. Knowing exactly how she feels, I am humbled by her courage and integrity. It is not only for her own sake that she makes the choice to descend now: it is for the sake of her Sherpas and the whole team, who would have to put their lives at risk if a rescue in the death zone was necessary. As she turns her back on the summit, I sense that she will return for and get it next year. I look down from the top of the Second Step at the long drop to the Rongbuk Glacier underneath – again, for ‘motivation’ – and begin climbing down. Slightly past the foot of the Step my knees bend under the weight of my exhaustion once more; then, I must get up again. When at length Pasang and I reach the top of the First Step, I’m finding it nearly impossible to get back on my feet after taking a ‘cough break’. Seeing how weak and unfocused I am, Pasang suggests that I rappel instead of down-climbing. My fingers are ‘dumb’ with fatigue, and my climbing partner has to help me with the figure 8. He climbs down first. Then, I get in position to rappel; I can’t do it as my arms will not hold any weight at all. There are people immediately behind me and I cannot go back, so I simply let myself tumble to the bottom of the rock face, slowed down a little by the rappel device. Pasang looks at me and, it seems, cannot believe what he’s just seen. ‘I know, I know…’ I mumble into the mask. Anywhere else I’d be embarrassed for such a display of climbing skill, but at over 8000 meters embarrassment is too long a word to pronounce and too small a feeling to bother with. We are now between the First Step and the Exit Cracks. The yellow tent town of Camp 3 is in clear view below us, seemingly close, but I don’t believe I’ll make it there. I am now staggering rather than walking, lingering at every rope anchor and, finally, I am unable to make another step. ‘I can’t do this,’ I whisper into the mask repeatedly, as if this unhappy mantra was my breath, and lie down. Resting on dark rocks under warm afternoon sun, I listen to the lullaby my mind is singing me: ‘You need to rest, to close your eyes – just for 15 minutes. A little bit of sleep will give you strength. Go to sleep, go to sleep…’ It’s a peaceful death: falling asleep in the warm sun, and never waking up again; or not so peaceful: waking up to an empty oxygen bottle at night and stumbling off the mountain in confusion. Suddenly, my daydreaming is interrupted as an array of faces appears out of the black emptiness of my mental exhaustion: my mother, my niece, my friends… Last night, as I was going for the summit, they were praying and cheering for me, sending me their love and strength from all over the world. And what did I do? I let myself get carried away by summit fever, and now I’m going to sleep. What a selfish pig! They love me and trust me, and I’m… what?… tired? Just tired?! Angry at myself, I wake up from what could have been my last dream. ‘Hey?’ I hear Pasang’s worried voice. ‘Sorry!’ I apologize. Still, I can’t find the energy to get up. ‘I can’t do this!’ every cell in body is screaming, so I slap myself on the face as hard as I can. Again, Pasang is looking at me like I am completely crazy. ‘I know, I know…’ I say, and we carry on down. The steep Exit Cracks pose the last obstacle on the way to Camp 3. I can’t remember how I make it down, but I’m guessing it wasn’t pretty. From the foot of the Cracks all we have to do is follow the slope to the campsite; we sit down again before my climbing Sherpa believes I’m ready to take on this ‘monumental’ task. 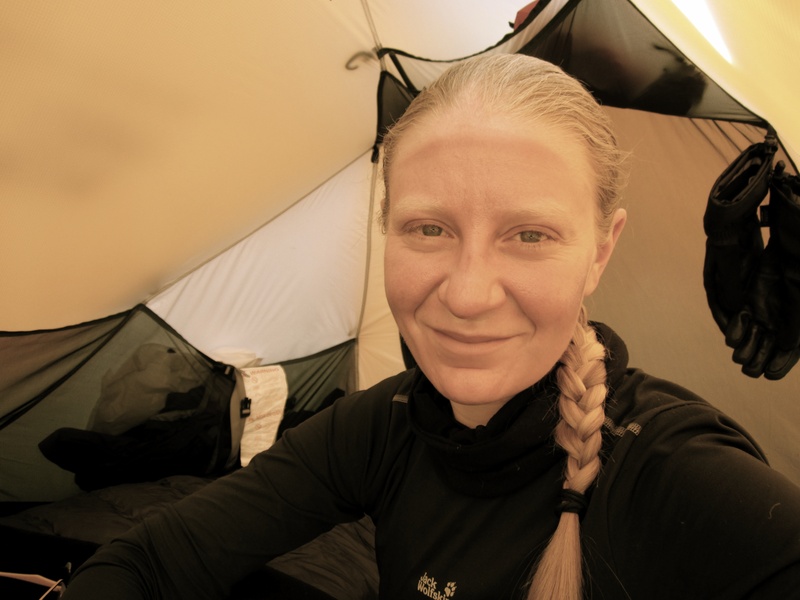 Although I’m only the third inji to make it back to Camp 3, tired as I am, I cannot continue the descent to the North Col. I sit by the tent like an abandoned rag doll, my whole body numb with exhaustion, pain and shame. I am thinking about the dead of Everest – of climbers just like me, with the same dream; with mothers, and children, and friends, and a home somewhere – about how they will never walk into Camp 3 like I just have, or get into a warm sleeping bag like I soon will, and then, in a few days – go home to be happy at times and unhappy at times and just alive, like I still am. This summit day, one of the hardest of my life, will never end for them, and I am so, so sorry for those climbers and their loved ones! Sitting there, in the loneliest place in the world, I remember how close I was to going to sleep, too, and I recall what – who – made me open my eyes again. Pasang takes my crampons off for me, and we crawl into the tent. We doze off for a while, then, he begins to melt ice for our tea and soup. 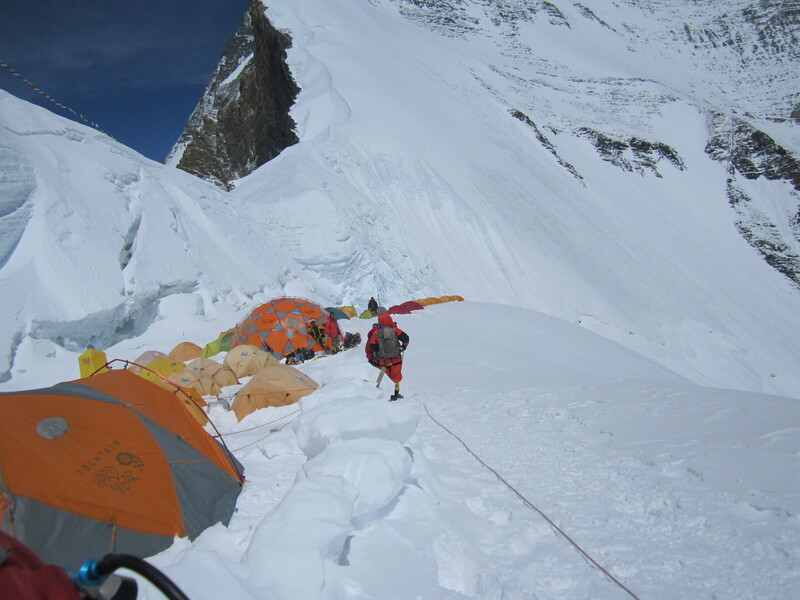 Soon, all the Junkies’ injis and Sherpas return to Camp 3, all – too exhausted to go any further. We spend a cold and windy night in the death zone, but nobody can sleep: the wind all around is too loud and angry, the exhaustion is too great, and the bright flashing images from summit day keep the mind working. It’s only in the early morning, after coughing for hours, when I finally see nothing and feel nothing – I must be asleep. It will not be long, however, before I open my eyes again and see that everything inside the tent is covered with a thin layer of snow. My feet are seemingly frozen and my hands are cold, too; they’ll have to warm up as I continue the descent to ABC almost 2000 meters lower. Quickly Pasang melts some snow to make water and tea before we leave the tent. Pasang and the other Sherpas have a tough day ahead of them: taking down Camp 3, the Junkies’ one remaining tent (and its contents) at Camp 2, and a part of our North Col Camp 1; then, they will carry all of that down to ABC on their backs. I cannot fathom how the Sherpas can do it – I can hardly imagine getting myself with a half-empty backpack down to 6400 meters… Someone like me could never reach the summit of Everest and come back to tell the tale without the help of these mountain supermen. All I can do in thin air – and not very well, and not always – is put one foot in front of the other and, wasting my breath, whinge about how hard it is. Everything else that had to be done for me to succeed and survive was done not by me but by the Junkies’ leader, Phil Crampton, and his team of Sherpas: sirdar Dorjee Sherpa, Pasang Wongchu Sherpa, Pasang Nima Sherpa, Kami Nuru Sherpa, Ang Gelu Sherpa, Nima Nuru Sherpa, Cheddar Sherpa, Chongba Sherpa, and our awesome cooks Da Pasang Sherpa and Pemba Sherpa. In fact, I think I have contributed ridiculously little to my own summit success, so I am very grateful for it to all the staff and team members of the Altitude Junkies 2012 Everest expedition. My descent through the vast, windy Everestland on the 20th of May is uneventful: still very weak, I fall once, getting entangled in an old rope between Camp 3 and Camp 2, but the safety line holds; then, I get severely windburned on the long, exposed snow ramp leading to the North Col – I’ve always wondered what windburn was, anyway; then, I think I’ll die of exhaustion (yes, again) as I ‘arrive’ at Crampon Point, but our kitchen boys are there with hot and sweet milk tea, and I’m back to life after drinking six cups of it. Eventually, Margaret catches up to me, and we stagger into ABC together, coughing in unison; after a light dinner, we drop half-dead in our tents. At ABC after descending: sunburn, windburn and joy! The next day is a rest day at ABC. Then, we head down to Base Camp, walking along the Miracle Highway for the last time; it’s melting. At BC we celebrate with a gorgeous dinner and sparkling wine. I am persuaded to have a little bit of the latter and, although I don’t drink, I agree, happy to entertain my entertaining team mates. We rest and pack for the next two days, and on the day before our departure for Zhangmu I go to my turquoise glacial lake for a good-bye swim. The lake is bigger than I remember but not warmer: it looks different, yet, it feels the same. With me it’s vise versa: now back in Kathmandu, I look the same after as I did before Everest, but I don’t feel the same: there’s something enormous, dark and cold stuck in my chest and, no matter how much I cough, it won’t come out. Everest is now a big part of me, with its conquerers and its victims, its icy nights of millions of stars and white windy days, with its hypnotizing power… I will never forget smiling at the rising sun on the Second Step of the sometimes merciful but, really, wrathful Chomolungma, or weeping for Her dead, who welcomed me. What can I say? I have summited Everest, but it remains a dream to me, as, perhaps, it should, to a mere human. This is certainly part of story too. I suppose so, Carl. Thanks for reading the whole thing! What does one do next…you confronted you fears and survived…most people never experience such a victory…congrats. Congratulations on summiting and SURVIVING ! Extreme courage. Welcome back to earth from the death zone. Mila you are great, what an achievement! Your story is inspiring and beautiful! Thank you so much, Henk! I wish your journey up Everest to be much easier and even more exciting and wonderful than my own was! Good luck and keep in touch! I read a good number of blogs related to climbing and so far yours is my favorite. I very much enjoy both the focus and the style of your writing. Good to hear you enjoyed your reading! Thanks for your feedback, and all the best! Thank you for taking the time to read and to comment! I am very flattered! Wow… simply amazing what you and the others who attempt this are capable of. Nice writing, too ! Thank you for reading! Glad you liked the story!